This one is like potatoes Anna on steroids and if I let him, my husband would eat this every day of his life. I got the initial idea from Chef Michael Smith’s show Chef at Home and then just added my own little stamp on it. You’ll end up with a creamy pile of buttery soft potatoes wrapped up in a crispy bacon shell. I added the onions and garlic and parsley, but feel free to throw in your own favorite flavors. It is admittedly a little bit of a heart attack on a plate, but I firmly believe that you can treat yourself now and then- everything in moderation…. especially bacon. MMM. Bacon. 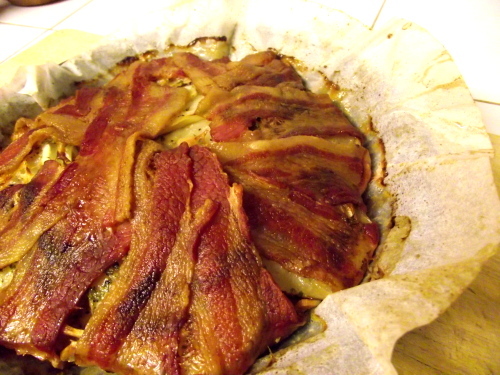 Cut parchment to fit into 9 inch pie pan and then starting in the center and working around, lay the bacon down and let it hang over the edges as you go around (You’ll be using it to wrap up the potatoes). Start with a layer of potatoes on top of the bacon then some onion, some of the garlic, salt & pepper and a little parsley and a sprinkle of cheese. Continue that order until you end with a final layer of potato. Wrap up layers with over hanging half of bacon and bake at 350 for 2 hours.